These days, there are a lot of different tools that supposedly perform the same function. This couldn’t be truer of Kali Linux, which is loaded with different tools that will help people hack Wi-Fi networks. The only problem for novitiate hackers is awareness. There are many would-be hackers and security enthusiast that can’t hack Wi-Fi networks simply because they don’t know what software to use. This software comes standard in the Kali Linux package, assuming that you choose to include the package in the installation process. If not, it can be downloaded and installed for free. The only caveat is that your wireless card needs to have packet injection functionality. Next is Reaver, which is nearly as popular as aircrack-ng. 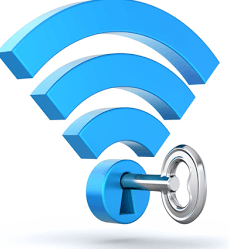 It is a highly sophisticated tool that is aimed at breaking Wi-Fi Protected Setup (WPS). Not only can it perform brute force password attacks, but it can also recover PINs for the WPA/WPA2 security algorithms. Believe it or not, most wireless devices in a home environment have WPS enabled by default, making Reaver incredibly practical. It’s not perfect, though. Patience is a virtue, and Reaver can typically crack a wireless router in 5 to 10 hours. The length of time depends on a variety of factors including password strength, wireless signal strength, and distance to the access point. Though less famous than the preceding two tools, PixieWPS also targets WPS security flaws. Like Reaver, it leverages brute force attacks against WPS PINs to crack wireless networks, aptly named a pixie dust attack. In the scope of security tools, PixieWPS is relatively young, but it has garnered so much popularity that it deserves an honorable mention. Wifite is yet another great tool to crack wireless networks using WEP, WPA, WPA2, and WPS algorithms. However, there are a lot of different parameters to setup before a user can begin using the software. Although, like aircrack-ng, Wifite will do all the heavy lifting for you, making the attack process ludicrously simple. In fact, many would agree that the most tedious part of the process is setting up the software. Not only can it capture the algorithms’ handshakes and de-authenticate connected users, but it can also spoof an attacker’s MAC address. Wireshark isn’t purely a wireless cracking tool per se. In fact, it is really a full featured packet sniffer that can be used on all of the major operating systems. Using this tool, users can capture data straight from the wire or grab wireless packets out of the air. As such, it is an extremely useful tool for those wishing to analyze and crack wireless networks. Though it is probably too advanced for novices to understand everything they are seeing in Wireshark, it is a handy way to see each and every packet that is being transmitted. In addition, it has handy filtering features that allow an attacker to sift through different protocol data to analyze a user’s activities. Lastly, it is available on most major operating system platforms, and there is a GUI as well as a Linux command line interface. Though it isn’t included in Kali Linux by default, it can capture handshakes and perform a variety of password attacks including dictionary and brute force. One of the real benefits of this tool is that an attacker can use their GPU cycles instead of their CPU to crack a password, thereby offloading the majority of the work and speeding up their local machine. However, it is only available for Linux and Windows, and there are some constraints regarding which GPU’s can be used, such as AMD and Nvidia cards. Fern was written using Python, and it is an auditing tool in addition to a wireless cracker. While the majority of the preceding applications only have command line interfaces on Linux, Fern actually has a GUI interface. If you’re new to Linux and scared of the command line, Fern might be the best way to ease into cracking tutorials. Like several of the previous tools, it can crack WEP, WPA, and WPS. However, unlike several of the previously mentioned programs, it can even perform a man-in-the-middle attack. It, too, is included in Kali. Wash is a little more simple than some of the preceding softwares. 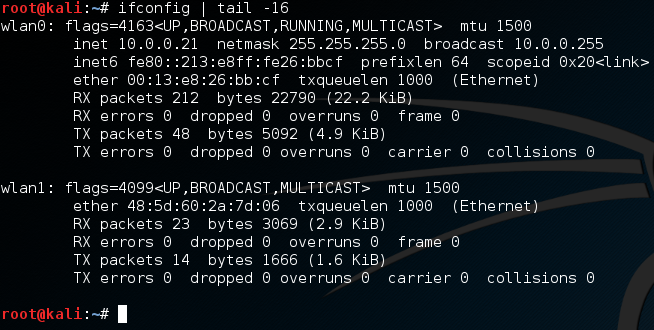 Instead of being a full featured cracking and sniffing suite of programs, it is a handy way to see if an access point has enabled WPS before carrying out an attack with another program. Furthermore, users can see if a targeted device, such as a wireless access point, has locked up after too many attempts with Reaver. Yet again, this tool is included with Kali. Though it sounds like a candy bar, Crunch is actually a handy tool that includes features to help attackers and security professionals tailor wordlists than can be stored in a dictionary. You see, no word list will ever be comprehensive. The percentage chance of a successful attack therefore depends upon the quality and size of the word list used. Plus, this tool can integrate with other programs such as aircrack-ng. Macchanger is a small, simple, and effective tool that does one thing: it helps attackers spoof their MAC address (go figure). This will help attackers mask their true address when carrying out an attack, and it can even spoof a network card to a completely random address. Today we are going to take a closer look at the vulnerabilities in the WEP (Wired Equivalent Privacy) protocol and see how to exploit those vulnerabilities and how hackers can gain access to a Wi-Fi network they don’t already have access to. We will be using the aircrack-ng software to facilitate the attack from a Kali Linux installation, but I wanted to point out a few caveats, warnings, and explanations before we dig into the demonstration. First of all, you should note that some of the attack process is similar to cracking the WPA and WPA2 Wi-Fi protocols. However, WEP is a different protocol altogether, so past starting the software on a wireless interface and performing the dumps, the process is a little different. In addition, you should note that we are not going to be taking advantage of a handshaking and reconnection flaw and performing a dictionary-based attack as we did with WPA. Instead, we are going to monitor wireless data and capture packets to deduce the key based on some well-known vulnerabilities. Before we begin the WEP cracking demonstration, you should have a general understanding of the protocol, its vulnerabilities, and how they differ from WPA and WPA2. First off, you should understand that WEP is a security protocol that uses RC4 security which is a type of stream cipher. The cipher uses a short key to generate a ‘random’ key stream, but this technology has been exploited for years. There are several ways that WEP vulnerabilities can be exploited. One way that it is commonly attacked is by comparing two streams that used cipher-texts with identical key streams. By using an XOR operation (Exclusive Or) on the data, the protocol can be reverse engineered. One of the fatal flaws in the protocol revolve around the CRC-32 checksum that is used to ensure that data hasn’t been changed in transit – otherwise known as an integrity check. By changing the bits and editing the checksum to a valid permutation, it is possible to fool the RC4 stream data into appearing valid. However, this is just the tip of the iceberg regarding WEP vulnerabilities, and you should know that these security flaws give rise to both passive and active attacks. Conversely, WPA suffers from a security vulnerability related to TKIP (Temporal Key Integrity Protocol). These flaws make WPA and WPA2 vulnerable to packet spoofing, decryption, and brute force attacks. 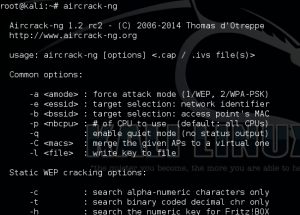 While the underlying mechanics of WEP and WPA are very different, you’ll find that you can crack either protocol in a matter of minutes (usually) by using the aircrack-ng software on Kali. One of the key differences between our attacks is how we attack the protocol. In the WPA and WPA2 tutorial, we used a dictionary of passwords to find the key. This time, however, we are going to be intercepting wireless packets out of the air with aircrack-ng (though there are many other types of packet sniffers) to discover the key data. Passive attacks are facilitated by a wiretapping technique that allows an attacker to intercept wireless communications until they spot an ICV collision. Then, the attacker can use software to deduce the contents of the data. Because of the flaws in the RC4 algorithm, an attacker can relatively easily gather data and cross-check that data to decrypt messages and even gain network access. Conversely, and active attack can be used when an attacker already knows the plaintext data for an encrypted message. Then, the attacker can manually craft additional encrypted packets to fool the WEP device. Because they know how to manipulate the hashing algorithm, they can fool the integrity checks, causing the WEP device to erroneously accept the packets as valid data. This is a type of injection attack, and they are surprisingly easy to carry out. 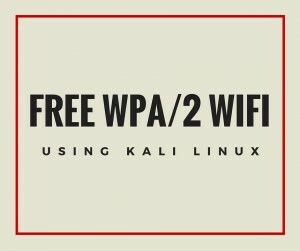 Make sure your wireless card is seen in your Kali Linux system. 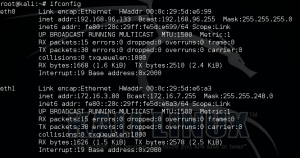 You can run the ifconfig command to look for wireless interfaces. You should see an Ethernet and loopback interface, but we are interested in the interface that starts with a ‘w.’ Likely, the wireless interface you want to use will be wlan0 unless you have multiple wireless cards. Note that you may have a wireless interface with a different name. If your interface’s name is wlan1 or it has a different name, append it to the end of the command. Make special note of the output, because it will create a listening interface, likely named mon0. If all goes according to plan, you should be able to break the WEP system. However, if the command fails, you will want to wait until your wireless card captures more data. Give it time to capture 15,000 packets and then try again. You’ll probably note that the attack procedure has fewer steps than the WPA/WPA2 attack procedure. While it may seem simpler on the surface, you should know that the WEP attack process revolves around capturing data transmitted by other wireless hosts. If there is only one host connected to the network or hosts aren’t sending much data, it will take longer to gather enough data for the attack to work. On the other hand, the WPA/WPA2 attack centered around using a dictionary of passwords after forcing a host to reconnect. It is a simple matter to break WEP encryption provided you have the right tools, but be warned. You shouldn’t ever abuse this knowledge. Doing so could lead to severe consequences that negatively impact your life. 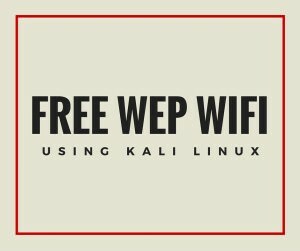 Make sure that you only attempt these attacks on devices that you own, and make sure that you never use WEP to secure your wireless access points and routers.